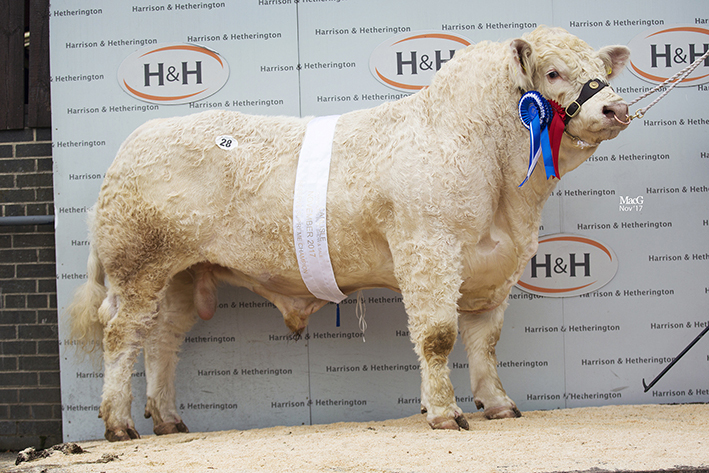 A small but high-quality offering of Charolais bulls saw a high of 5,500gns and an average of £3,304, for the 15 bulls sold at Borderway Mart for the breeds last official sale of the year on Friday 17 November. The clearance rate was up by 18% on the year, continuing the trend that has been consistent throughout every one of this year’s Society sales. 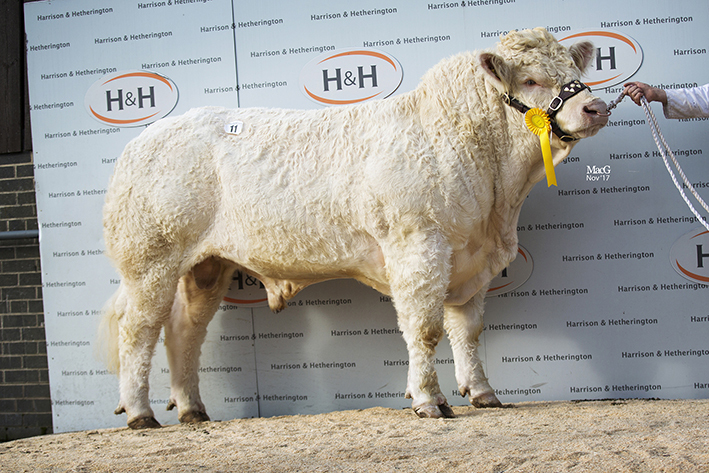 The trade topper at 5,500gns was the reserve supreme and reserve male champion from breeders Mark and Jane Hayhurst, Kirbymisperton, North Yorkshire. 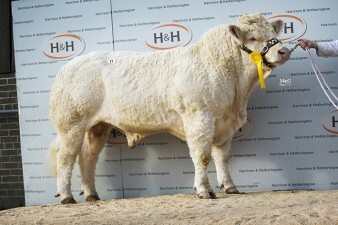 The 18-month-old Whitecliffe Mountain is sired by the home-bred Whitecliffe Highlight and out of Whitecliffe Harriete, who goes back to the 38,000gns Perth reserve junior champion Goldies Champion and was purchased by G McClanachan and Sons, Torthorwald, Dumfriesshire. 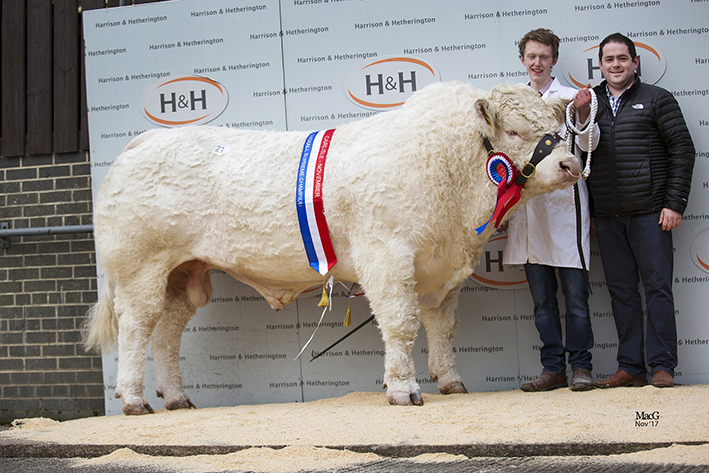 A delighted Jane said that “He was a great calf out of Whitecliffe Highlight who is producing progeny perfect for meeting todays market specifications. His homebred sons have sold to 6,200gns this year through the ring, are selling just as well from home and he is producing well on other farms too through AI sales. We also use him on our sucklers and his first commercial progeny sold this spring at just over 12 months old. One went to ABP at 12 months and nine days, with a dead weight of 446kg and making a total of £1498, while another sold live at 800kg, five days younger for £1450”. Next and selling for 5,400gns to PL Heard, Okehampton, Devon, was the February-2016-born, yellow ticket winner Bassett Magnet, from Jean Atkinson, Malton, North Yorkshire. His sire is Bassett Inspector and his dam Bassett Dolly is sired by the Northumberland-bred Thrunton Troubadore. Following on at 5,200gns was Glenbuck Mint ET who had been selected by Judge Eimear McGovern as the day’s supreme and male champion. The 22-year-old Eimear travelled over from Clogher, Co Tyrone, with a film crew who have been filming the McGovern family throughout the year for the up-coming TV show Rare Breed – A Farming Year, which will be aired on UTV and TV3 in Northern Ireland from January, and will also available on ITV player. She commented “I feel very honoured to be asked to judge here today and chose Mint as Champion for his power, shape and locomotion”. The 19-month-old Major-sired Mint, whose dam Yambo Hanora who goes back to Doonally New was snapped up by AJ Ewing, Annan, Dumfriesshire, from breeders and exhibitors Robin and Damien O’Mullan, Rasharkin, Co Antrim. Heading up the female section at 3,800gns was the reserve female champion from Fred, June and Emma Andrews, Holmfirth, Yorkshire. 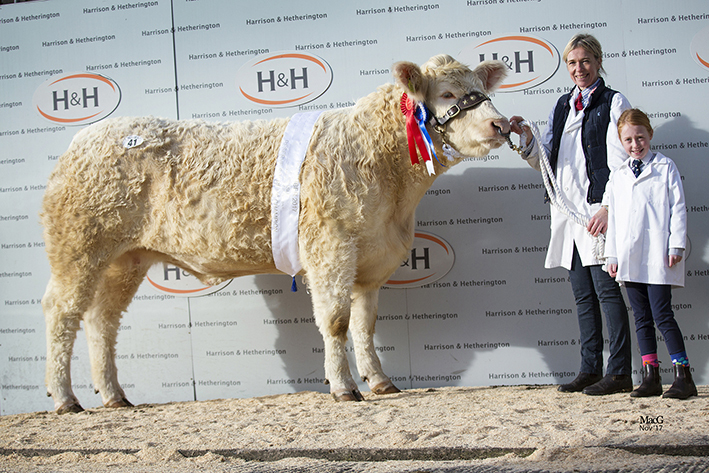 The September-2015-born Holtstead Lottie, is sired by Balthayock Hamish and out of the Royal Show senior male champion Gretnahouse Archangel-sired Thrunton Debutante. She was purchased in-calf by David Hazell, Bicester, Oxfordshire. Also in the money for the Andrews family was a cow and calf outfit selling for 3,700gns to JR Germany, Coltishall, Norfolk, having been placed second in their class earlier at the pre-sale show. Mother Holtstead Imagine, who was crowned breed junior champion at the Great Yorkshire Show in 2014, is a 2013-born daughter of the 22,000gns Newhouse Bigal and Holstead Veronique, who goes back to 10,500gns Carlisle reserve supreme champion Gretnahouse Noel, and her 3-month-old daughter Holtstead Nigella is sired by Goldies Eddy. As an added feature of the sale there were drafts from three Charolais herds. The first was the Gretnahouse herd of Alasdair Houston, Gretna Green, Dumfriesshire, whose heifers took the fancy of aforementioned David Hazell from Bicester, who managed to bag four out of the five on offer. The highest priced at 2,400gns, was the June-2016-born Gretnahouse Mulona, whose breeding includes the 12,000gns Carlisle reserve senior champion Wesley Equinox and the homebred Gretnahouse Fulona who in-turn is sired by the 25,000gns Perth senior champion Thrunton Camelot. Then D Smith and sons, Mauchline, Ayrshire offered four cow and calf pairs. The top priced at 2,200gns was a mother and daughter set, Lawersbridge Hope and Lawersbridge Nettle. Hope is a daughter of herd sire Smithston Elite and Redheughs Essex who goes back to the Northern Ireland National Charolais Show reserve male champion Glencoe Vision, while her daughter Nettle is sired by the Dumfries Show male champion Lawersbridge Iceberg. Both travel on to Balerno, Mid Lothian with purchasers Messrs Wardlaw. Finally, there was a major reduction from the Ashby herd of David and Carol Noton, Grimsby, Lincolnshire. Their top priced was Ashby Lucy, who is an October-2015 born daughter of Blelack Digger and the Clyth Diplomat-sired Ashby Hyacinth, she also purchased by David Hazell, this time for 2,500gns. Averages: 15 Bulls £3,304; two cow and calves £3,203; two heifers £2,730; five Gretnahouse heifers £2,331; four Lawersbridge cow and calves £2,021; five Ashby cow and calves £2,079; one Ashby cow £1,890, three Ashby heifers £1,820.